I want to get into the investment game, but what is the best property for me? and how do I decide if it is an A Class Property or B class? How do I decide? Is it different by Market or by Neighborhood or by School? It seems like the choices are endless or maybe even confusing. I don’t want to make a mistake. Which way do I turn? As a 20 year veteran investor in the Indianapolis market, these are questions that are often asked by new and experienced investors that are considering the Indy market. What I have found is that all these concerns really boil down to 1 question … How much am I going to make? So, what property Class is better? Of course, Class “A” properties are better. We were taught that in elementary school and we tell our kids the same thing. An “A” is always better than a “B”. But is it better for me? Let’s dig a little deeper. There are certainly other “Things” to consider. Market, age of the home, what’s happening in the neighborhood, schools, and of course the 3 most important things in Real Estate: Location, Location, Location, AND THE MONEY. I think it also depends on your Risk Tolerance and desired stability and hopeful return on investment. I often talk to investors who want to talk about ROI or a Cap Rate. Indianapolis is built on a circle. At the center of that circle ( downtown Indianapolis) the homes in general are built in the late 1800s and early 1900s. Approximately each mile away from that circle represents 10 years in the age of the housing stock. Our Highway that surrounds the city is 465. In general the homes right inside the 465 loop are built in the 1960’s. If you were to invest just outside the loop, that housing stock would be built in the 1970’s. As urban sprawl continued you will see that each mile will continue to represent another 10 years in Year built for those homes. In terms of repairs and the type of things that are concerning to investors, here is a brief description. 1800-1910- Generally built on a cellar or cinder block foundation, If the foundation has not been maintained, then the foundation could cause settling and unlevel floors and un-even doorways and cracks in the plaster walls and ceilings. 1910-1920 – Generally built on a basement- little insulation in the walls at time of construction, Mostly all wood windows, large drafty homes with high ceilings and tall roofs. Original wood flooring is a great feature in these homes if water has not breached the home. 1920-1950 – It seems the homes started to be a little smaller. Brick and stone was the material of choice, unlike the wood structure homes of previous years. A little more energy efficient. These began to have asphalt shingles as opposed to wood shake roofs. Wood windows and wood flooring can be found in many of these homes. 1960-1970 – returning soldiers from the Vietnam war were in need of affordable housing. There was a big push toward simple and quick. You can see a large number of 1 story homes built with slab construction and 2 x 2 walls. They had low pitched roofs and simple construction. 1 wall with plumbing. The bathroom was on one side and the kitchen is on the other side of the shared wall. They were all built on the same floorplan. Each home is between 925 sq. ft and 1100 sq. ft. 7 windows and a simple kitchen and 1 bathroom. 1970-1980 – These homes are built with drywall construction and many on Crawl spaces and a few on basements. Many are brick homes with aluminum windows. In general, these homes have smaller kitchen and dining areas that are separate. 1990 + - Newer floor plans that fit todays lifestyles. Larger closets and open Family rooms take the place of the older style kitchen and dining areas. Typically slab construction and a move toward more energy efficiency with vinyl windows and better insulation. Neighborhoods can vary widely. In Indianapolis there could be a Class A property and 2 blocks away could be a war zone. My experience is that your tenants will be familiar with the neighborhoods and are willing to accept the product type that comes with that neighborhood. As long as your tenant wants to live in that neighborhood and the home, then you should be able to create a good tenant/owner relationship. I have found that people in Indianapolis are pretty loyal to their school systems. If they grew up in a township school, then they want their kids to go through the same school system. I understand that there are plenty of grading systems available on the internet through some of the large real estate search engines. However, from someone who lives in the Indianapolis area for most of my life, I can tell you that almost NONE of my tenants look at those internet grading systems and make a choice whether or not they want a rental based upon the grading system provided by a search engine. 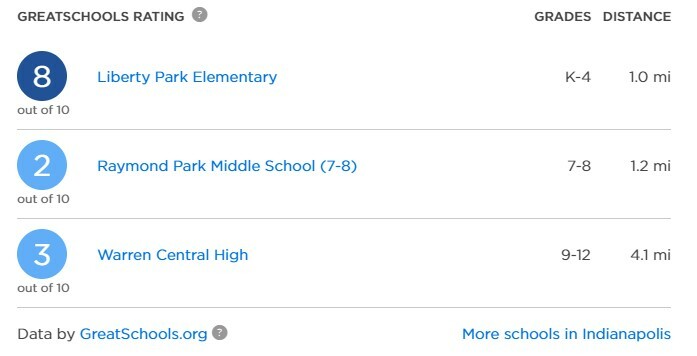 For example: http://www.greatschools.org/ is a rating tool that is provided by Zillow. I ran a search of homes and located XXXX Cole Wood Ct, Indianapolis, IN 46239. It is a very nice 4 bed 2.5 bath 3 car garage home built in 2002. 2494 Sq. Ft. priced at $ 169,900. It is in Warren Township Schools. This would definitely be a Class A property by most grading systems. But if you look at the schools for this property then you would be less than impressed. Here is the grading system for that address. 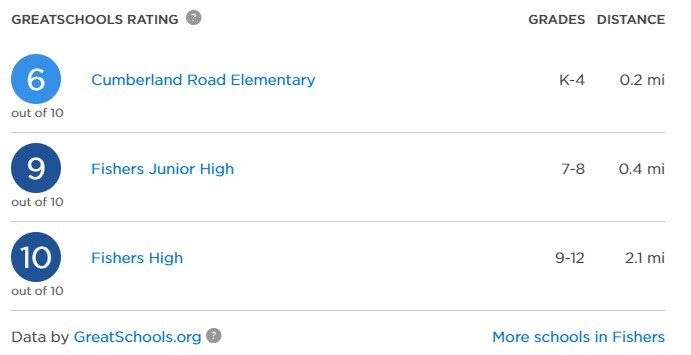 As you can see the Middle School and High School rank is very low according to Greatschools Rating system. Try to tell that to an alumnus of that school system who has children attending that school. They will swear by that school. I ran a quick check of another school system in our market for comparison purposes. This is another school that has a loyal alumnus and passionate parents. The school system is called Hamilton Southeastern: As shown below the schools have a much better overall rating according to Greatschools. I ran one other comparison. I ran a comparable sales analysis to see how fast homes are selling in Warren Schools vs. Hamilton Southeastern Schools. Results: Homes in Warren School District sold on average in 50 days. Home in Hamilton Southeastern sold on average in 36 days. The message for me is that people want to live in both school systems and are moving there on a regular basis. I believe that tenants are going to move to the Location that best fits their lifestyle. Roi is a good term to use when making a purchase decision and I think it’s important to consider, but any ROI analysis is ONLY an ROI analysis on paper. Where the rubber meets the road is the actual performance of your investment property over the long term. You can look at all the spreadsheets and I think they are valuable. I think it is even more valuable to review them on a regular basis to see if the performance is meeting up to expectations. When you look at an ROI analysis there are certain variables that you can count on. Your property taxes and insurance costs are fairly predictable. If you are borrowing money to make your purchase then your Principal and interest payments are predictable. The only item that is Not predictable is the vacancy and maintenance on your investment property. I believe that the age and condition of the home and tenant selection will help determine how long you will enjoy the cash flow from your rental property. It is easy to say that the lower the purchase price and the lower the rent, the higher the Risk. Which means the higher the purchase price and the higher the rent the lower your Risk. So here is a property Class Illustration for the Indianapolis market. So, what’s the best property for you to purchase for your rental portfolio. You should talk to someone who has been IN the game and can provide some assistance. Anyone can send you a list of properties. Not everyone can guide you to ones that will fit your long game investment objectives. Rental Real Estate is an Excellent way to build long term wealth, but it helps to have a seasoned investor mentoring you.